Why is it so difficult to get certain basic ingredients? Now that the wedding is over, its time to invite friends and relatives home to have a look at the photos and dinner. The first family was entertained on Friday. I made mashed avocado and tomato bruschetta, sesame honey chilli potatoes, for starters, salad and pizza. I wanted to make some mousse for dessert. Went to the famous Nakumatt to buy some fresh whipping cream. Came home with the packet, opened it and the cream had turned sour. I went back with the packet, receipt and all. The store policy is that if you return any goods, you must buy another one of the same. That means I had to buy another packet of whipping cream. The catch 22 is that the whipping cream and double cream whichever brand name you use, is made by the same company, Brookside. Hoping that the other packet will be fresh, I got it exchanged and went home. Opened it, tasted it and this too was spoilt. So went back… there was no way I was going to let my Ksh 496/- go to the bin. It took me over an hour to get a voucher for that amount, and tried to convince the customer help people that fresh cream going bad is not my fault. What was annoying is that in spite of the cooler weather, the fresh cream from the supermarket refrigerator was all spoilt. This clearly means that somewhere between Nairobi to Mombasa, the cold chain is not maintained. Its frustrating that in spite of spending so much money, we still are not able to buy quality.I am amazed that such a big company like Brookside is still not able to overcome this problem of fresh cream getting spoilt quickly. In the western countries the single cream, double cream, half and half, 2%, 3% etc etc occupies a huge section of the fridge. During my trip to Montreal I had bought some Quebon fresh cream for dessert and it stayed fresh for 2 days in the fridge. Here, getting a simple fresh cream, be it single or double is a task. Just as well that experience with fresh cream here and in India has got me tasting it before I even start to make the dessert. I came back home with some vanilla ice cream and my mind was completely blank as to what I was going to serve for dessert. Mango and ice cream perhaps as mangoes are in season. While watching my favourite serial, Balika Vadhu,( yes I still watch it!) it dawned on me to browse through my blog to search for a dessert without cream. Upside down pineapple cake caught my attention and decided to serve mango and ice cream in a more innovative way. I am glad I baked it in the morning as it was a hit with my guests. Keep the mango sliced and ready. Sprinkle the lemon juice over it. Grease a 10 to 12 inch cake pan. Add the sugar and stir till it melts. Let it simmer over low heat, at this stage do not stir. When bubbles begin to appear at the sides, take the pan off the heat. By this stage the sugar is caramelised. Pour the caramel into the cake tin. Spread it out evenly. Arrange mango slices at the base of the tin. Try and fill in the gaps with small pieces of mango. Sieve flour, baking soda, cardamom powder and salt together into a bowl. In another bowl, add the butter and soft butter. Beat it till it becomes soft, light and fluffy. Add the yogurt and vanilla extract and mix well. Add the flour mixture and fold it into the creamed mixture. Pour the batter over the arranged mango. Spread the batter evenly over the mangoes. Bake in the oven for 30 to 35 minutes or till the top appears golden brown and the cake is done. Insert a toothpick or sharp knife into the middle of the cake. If it comes out clean, the cake is done. Run a spatula along the edges of the cake and gently remove it onto the wire rack to cool. The mango layer will be on top. Let it cool down completely before serving with fresh whipped cream, ice cream or hot custard. Next time I will use light brown sugar or normal sugar to improve the colour of the mango layer. Instead of cardamom use orange zest for flavouring. To remove the cake from the tin, loosen the sides gently by running a spatula all around the edge. Place the wire rack over the tin upside down. Holding the tin under one hand and the rack with the other, flip it over. Remove the tin. I prefer to use a spring form tin for all upside down cakes. It is easier to remove the base only. Use a sharp knife to cut mango slices properly. Don’t use over ripe mangoes for this. 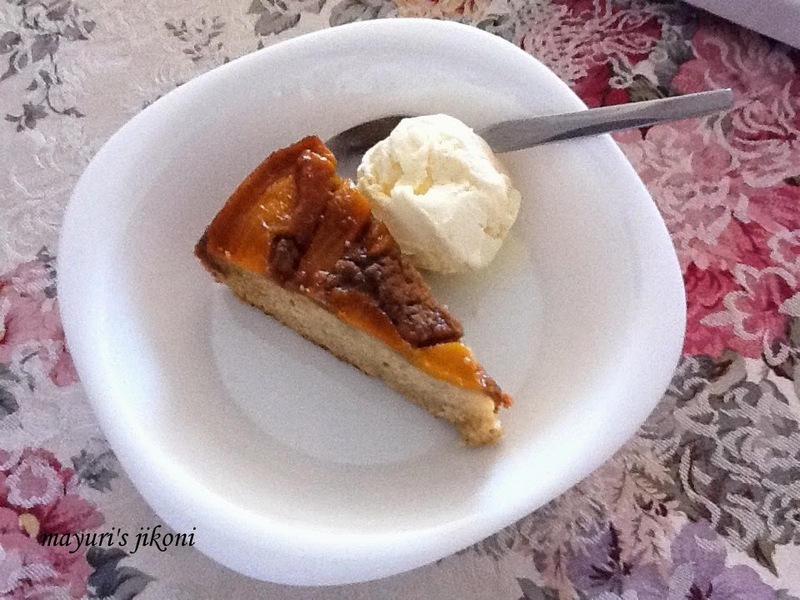 Mango upside down cake sounds very innovatiive, prefect for the season. Looks superb, now being mango season, perfect time for doing this..
Wow…… Cake looks absolutely super yum!